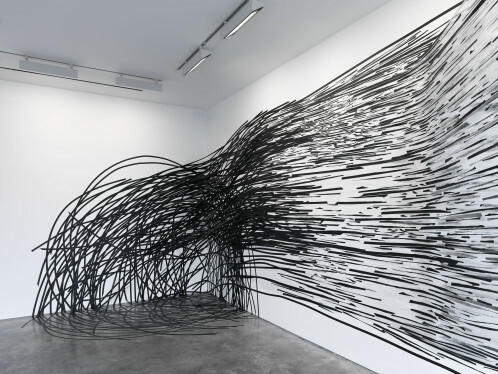 Drawing Room are the guest curators behind the exhibition on view at Lisson Gallery entitled ‘Line’. Through fifteen different artists and works from the late 60s to nowadays, the common theme is unmistakable: the line. Installations, videos, paintings, no medium restriction are forced upon the artworks as long as they respond to the topic. With a timeframe of fifty year, a real art history of the line draws itself through the exhibition. Sol LeWitt and his ‘Wall Drawing #157’, a diagonal line graphically inhabiting a square or Athanasios Argianas and his three-dimensional installation dealing with metallic forms are both linked with the line thematic. 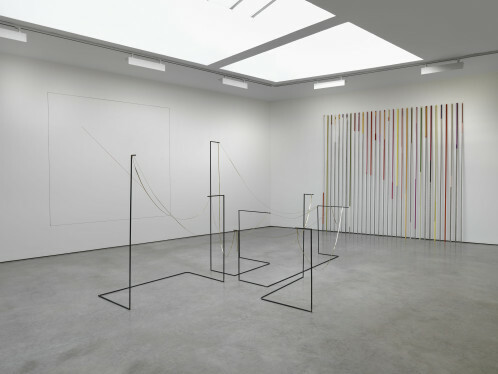 While, Ceal Floyer ‘Taking a Line for a Walk’ is inspired by Paul Klee’s famous saying that ‘a line is a point, which goes for a walk’, Raumzeichnung, a work by Monika Grzymala crosses the border of the gallery by expanding its lines on the outside. The cited artworks share top billing with photograph from Tom Marioni, vinyl text of Richard Long and colorful sticks from Jorinde Voigt among others.